Traditionally, Labor Day is celebrated by Americans as the symbolic end of the summer. The holiday weekend is often regarded as a time for parades and celebrations. So enjoy the upcoming Labor Day weekend! However, this weekend also take to think of the thousands of fellow Americans in Texas and along the Gulf Coast who have been severely affected by Hurricane Harvey and the continuous rains of near Biblical proportions. The recovery from this terrible storm will require years of recovery for the Houston region, and we will each need to be talking about contributing or doing whatever possible to assist their recovery. A reminder, the September ‘Final Friday’ event in downtown Newark will be an Apple Festival on Friday, September 29th. The historic Licking County Courthouse’s restoration will be complete this year, and plans are underway to return the Christmas decorations in 2017. 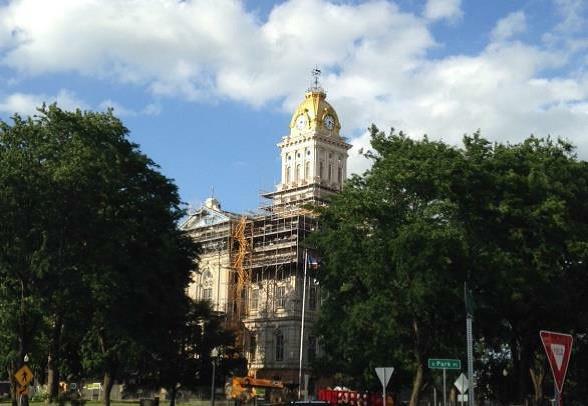 The ornate tower’s restoration is complete (see photo above), and tuck pointing and installation of lighting are about done. The final exterior improvements will be complete as the new roof is installed. Inside the installation of a modern elevator and restoration of the skylight are both underway. The Licking County Courthouse Christmas Lighting Committee and the Canal Market District (CMD) are working collaboration for the annual Licking County Christmas Kick-Off Celebration on Friday, November 24th. The second annual Christmas Marketplace is being planned, along with the traditional lighting of our 1876 Historic Courthouse that evening. Finally, ‘congratulations’ to two great Licking County friends who are moving up. Last month Granville’s Jeff Hussey was sworn in as State Fire Marshall and Newark’s Bill Spurgeon was sworn in as Deputy State Fire Marshall. The State of Ohio is the big winner here! cover the ever increasing costs for services to children. This is a critical community issue as the number of children in the care of the County has doubled over the past couple of years. This one mill levy would cost property owners about $35 per year per $100-thousand in home valuation. John Fisher, the Director of the County‟s Department of Job and Family Services explains, the current Children‟s Services Levy continues to fall short of the need with growing numbers of children being served, some with more severe behavioral issues requiring increased residential treatment because of the parents‟ drug addictions. 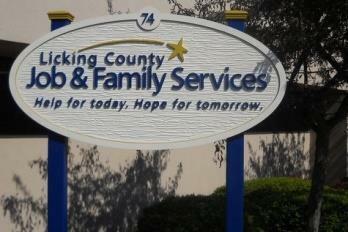 The number of children in the care of Licking County is now nearly 450, up from 366 at the end of last year. Fisher adds, I believe we can‟t wait as the needs of these children continue to grow. This year the shortfall in children‟s services funding will top $3-million necessitating the levy request. We need your YES vote in November! It is no secret to local drivers that this is the orange barrel season across Licking County with road and bridge projects everywhere. Along with local, county and state highway paving this season, the County‟s continuing Bridge Improvement Program will have completed construction on 30 additional bridges by yearend. 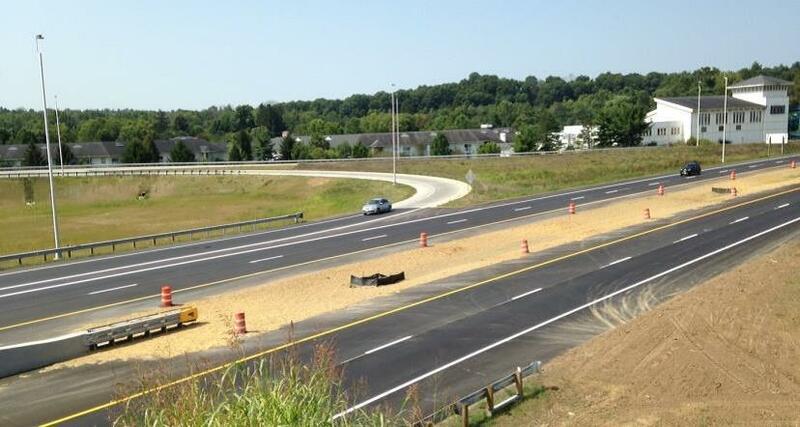 Meanwhile, work is in the final stages of the new and larger I-70 bridge and ramps at Ohio Route 310, and the County‟s TID project to widen Route 310 north to U.S. 40 is underway. At Mink Street and State Route 161 the new diamond interchange to serve the growing New Albany development park is on schedule to be complete this year. At long last motorists who use Ohio Route 16 through the busy Newark Granville westside corridor are seeing the completion of this much needed project. This two year $30-milliion realignment and expansion of the busy intersection is considered a major safety and economic development improvement. State highway capital dollars made available through the leasing of the Ohio Turnpike were applied to this „shovel ready‟ project, with Newark, Granville and County support. The final touches have been the complete final asphalt paving of the old and new sections of roadway, and the addition of striping and guardrails. 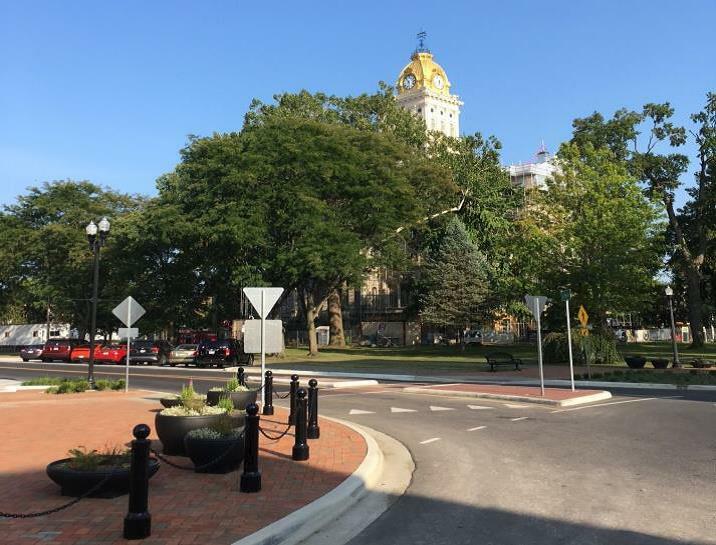 In downtown Newark motorists and business owners were heartened recently with the completion of the downtown Square, featuring circular transitions on each corner and two-way traffic. Observers continue to note the attractive new infrastructure including bio-swales with landscaping, and new curbs sidewalks. From my observation the flow of traffic is continuous and popular by most drivers, as was predicted by the designers for the City of Newark. The County‟s downtown government buildings and local businesses have tolerated an intense two year construction period that allowed for the $19-million EPA mandated sewer separation project, and all agree the final result was worth the headaches. A recent project to facilitate traffic flow on the busy Sharon Valley Road corridor in west Newark was completed in time for the opening of school. 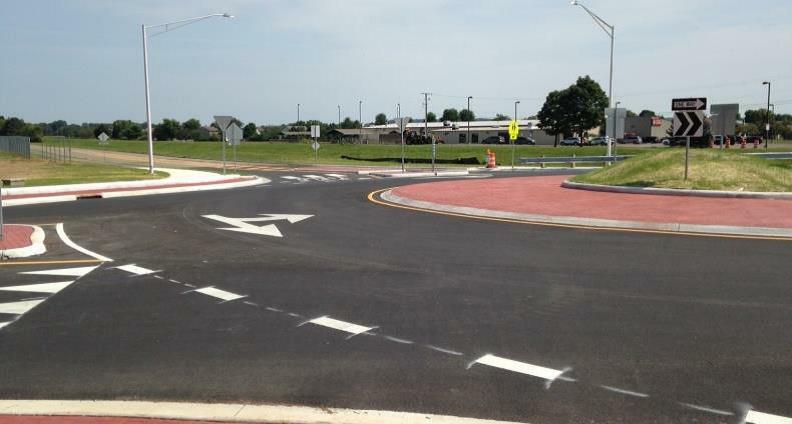 This new round-a-bout at the Sharon Valley Road intersection with Evans Drive that leads to the Liberty and Legend school buildings and the access road to the Newark Campus is a major safety improvement, while eliminating morning and afternoon traffic congestion. City Engineer Brian Morehead says, the project was completed at a cost of $950-thousand. The cost was shared between the City, Newark Schools, and grants and loans from the Public Works Commission. 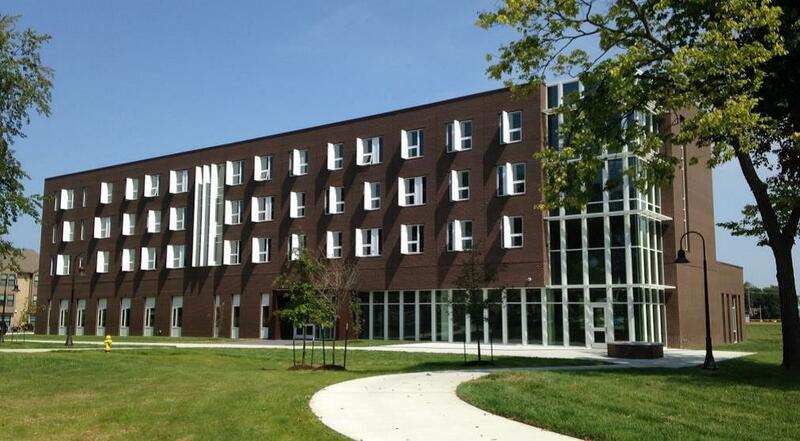 The newest building on the OSU Newark-COTC Campus has opened just in time for the fall semester. This new residential high rise is named for longtime Campus supporters Jane C. and William T. McConnell. Housing 120-students, the McConnell Residence Hall will also accommodate special events for up to 300-people. This is a major addition to the on Campus student housing and will serve mostly Ohio State students who were the winners of a lottery among full time students seeking housing on Campus. November 1st is the projected opening date for the new wider bridge over Ohio Route 16 (the Newark Expressway) at Mount Vernon Road (Ohio Route 13). This larger bridge is paid for with State, County and City funds, and will accommodate two way traffic north and south, as well as pedestrian and bicycle access. The George Igle Construction Company has fast tracked the project and poured the concrete deck in last month. Traffic is currently detoured around the project using ramps and limited access. This bridge will proudly say‟ Downtown Newark‟ as a welcome and the Newark City logo will be relocated from west Newark to this downtown exit. 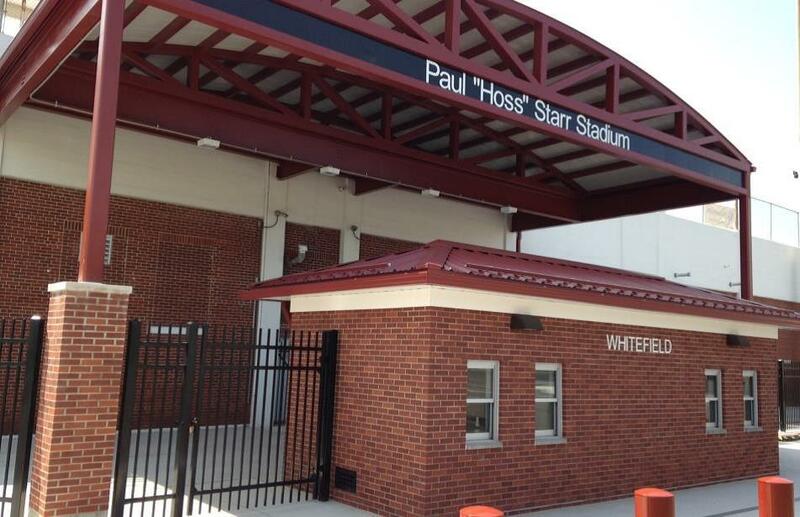 renovated stadium is being dedicated in the memory of longtime Newark Football Coach Paul „Hoss‟ Starr. The ceremonies to dedicate the stadium to Hoss‟ memory will happen before the 7:00pm kick-off, at 6:45pm. Former players, alumni, coaches and fans are urged to attend! Back in downtown, while the Square renovation is complete, the City‟s major sewer separation project will continue into 2018. The North Third Street corridor from the Square to West Church Street will be done by yearend, while the section of North Third up to Locust Street (in front of the Elks) will be complete in mid-2018. In 2018 the project will be expanded to two blocks of Church Street between Second and Fourth Streets. Again, these projects are the result of EPA mandates on the City to separate the sanitary and storm sewers, to eliminate environmental concerns. 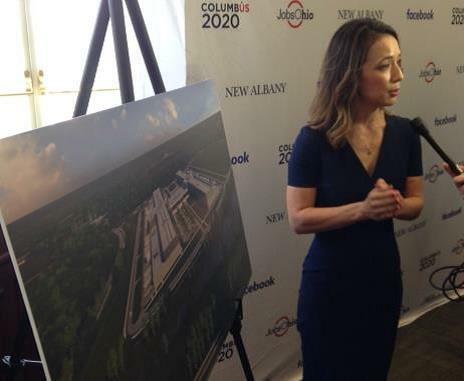 Economic development efforts by New Albany and Licking County, in conjunction with the State, have resulted in a commitment by Facebook to build a huge data center here. To be located on some 345-acres in western Licking County and in the City of New Albany, the Center will be located south of State Route 161 and east of Beech Road. This massive data center will cost some $750-million making it one of the largest economic development projects in recent years. The first building (see the concept photo) will be some 970-thousand square feet in size, according to Facebook spokesman Rachel Peterson. This phase one will involve one thousand construction jobs, with some 100-permanent jobs of a highly technical nature being created. 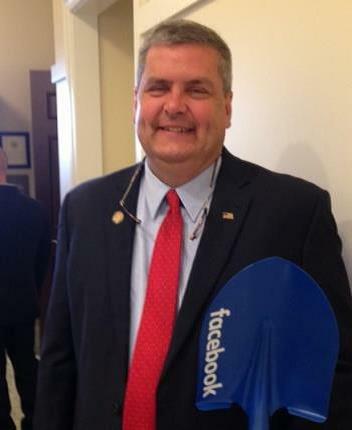 Local officials including myself representing the County, Senator Jay Hottinger and Representative Scott Ryan (photo) were on hand to greet Facebook officials. This Licking County data center will be the tenth for Facebook, which is the world‟s largest social media platform. The addition of this data center over the next three years will bring the New Albany business park to 11-million square feet and 15-thousand committed employees. On August 28th history was made as Bill Weaver was sworn in as a Member of the County Planning Commission and Wes Weaver joined as his Alternate. It is believed this is a first time a father and son combination have served on this important panel. Plans are being finalized for the 3rd annual „Haunted Jail‟ event on the five weekends in late September and October leading up to Halloween. Proceeds from this „family event‟ during October will go toward continued preservation and restoration of the Historic Jail in downtown Newark, which dates to 1889. 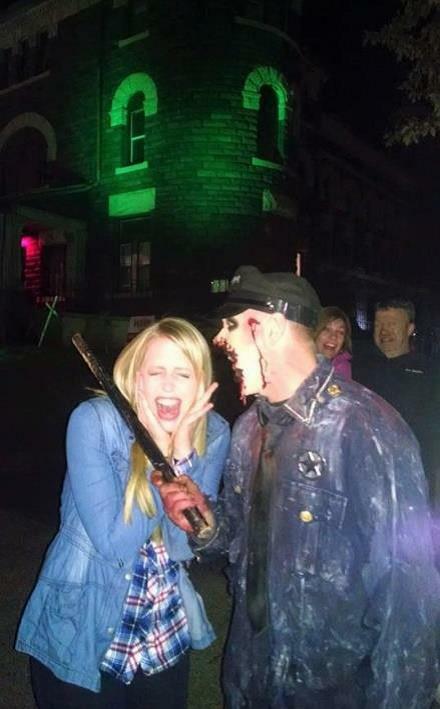 The „Jail of Terror” haunt event will kick-off the weekend of Friday and Saturday, September 29th and 30th. It will then run the following four weekends in October, each Friday and Saturday night. The times for these „haunted events‟ is 7:00pm till Midnight each evening! Tickets are $17 or $25 for Fast Pass, which allows you to go to the head of the line. More information will be available at http://jailofterror.com or call 740-345-JAIL (5245). Parking is free. In addition, the community is invited to a 1st time special event – on Saturday, October 14th – it is the ‘Jailhouse Rock Beer Fest’. Some 13 local and regional breweries will be on hand, along with several outstanding ‘rock’ bands. The cost is $12 the day of the event. It will be in the Canal Market Pavilion, beside the Jail of Terror, and will run from 5:00pm till 10:00thaty evening, rain or shine! This Beer Fest also benefits the preservation and restoration efforts of the Historic Jail. *If you are interested in volunteering to help at this event or any Jail event, call 740-345-JAIL (5245). Square and immediate side streets on Saturday, September 9th. Matheny adds, the registration fee remains $10.00 per entry, and registration runs from 9:00am till 4:00pm. Awards and trophies will be presented from 6:30 pm-7:00 pm from the area of the Courthouse steps. 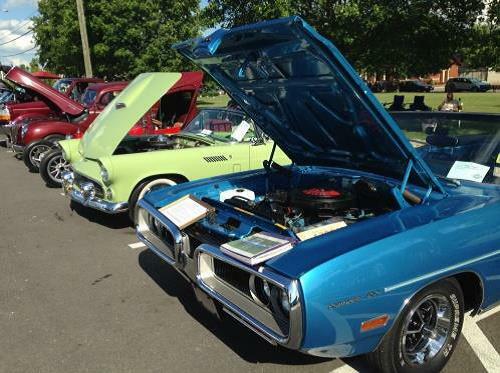 „Lite the Nite Car Show‟ is one of the best events in Newark each year and proceeds help support the annual Christmas Lighting of the Courthouse. As part of the commemoration of the end of the Vietnam War this year the recent Pataskala Fireman‟s Street Festival Parade recognized a group of some 21 men and women in that community who served in or during the conflict. I would tip my hat to the Pataskala Rotary Club and especially Rotarian Judy Baird for as great effort to honor these great Americans. In addition to serving as the grand marshals for the parade, they were also honored in a ceremony afterward at The Nutcracker in Pataskala. Honored and pinned were…Air Force Sergeant Jim Bell, Marine Lance Corporal Charles Caldwell, Marine Sergeant Paul Clark, Air Force E-4 Joe Craig, Air Force Airman Skip DeGonia, Air Force E-4 Frank Dixon, Air Force Sergeant Ken Dray, Army CW 3 Jim Howell, Navy E-4 John Jauch, Army Sergeant Harry Litton, Army E-4 Frank Miller, Navy E-3 Robert Morgan, Army E-4 Tub Noble, Air Force Sergeant Jim Reed, Army E-3 Skip Rockey, Army E-4 Linda Simpson, Air Force Sergeant Doug Smith, Army SFC Bob Taggert, Army Sergeant E-5 Diana Taggert, Army Sergeant E-5 Will Thompson, and Army E-5 Jerry Wheeler. 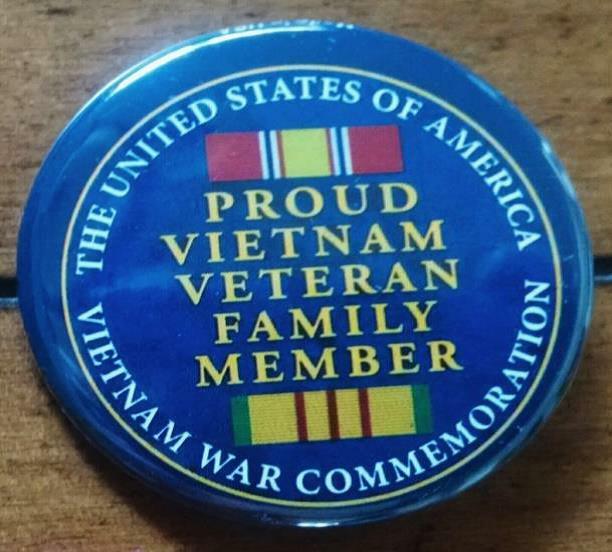 In addition family members of the vets were honored with a special recognition button (photo). The Licking County River Round-Up will celebrate its 23rd anniversary in 2017! This year‟s river clean-up will be the morning of Saturday, September 9th from 8:00am till 1:00pm. 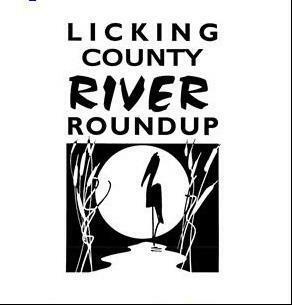 For details visit River Round-Up at the Licking County Soil and Water Conservation District‟s Facebook page, call 740-670-5330, or e-mail information@lickingswcd.com Licking County Litter and Recycling is proud to join the list of sponsors for this event. The River Round Up event begins that morning at 8:00 am at numerous waterway locations throughout the county. Volunteers may choose to kayak, canoe, walk in streams, walk on land or nearby paths, or assist with logistics. Last year over 320 volunteers participated in the River Round Up cleaning up trash, metal, tires and recyclables from waterways throughout the county. Nearly 26 miles of waterways were successfully cleaned with volunteers collecting a total of 4,790 pounds of trash and 4,220 pounds of recyclables. Additional partnering agencies in 2017 include: Licking County Recycling, Licking Park District, The Dawes Arboretum, Explore Licking County, Villages of Granville and Hebron, City of Heath, Jobes Henderson, Ohio Certified Volunteer Naturalists, City of Newark Stormwater Utility, Union Township, Village of Utica, and numerous community members. The Presenting Sponsor for 2017 is Shacklefords Refuse. Join Licking Park District staff at Taft Reserve for a guided hike by the full moon. The topics will highlight the flora and fauna of Licking County. The hike will begin at the parking lot and will last about an hour. Feel free to bring a flashlight, but be prepared to keep it off. Please wear appropriate clothing and shoes for the weather. We hope to see you under the Full Moon! We are excited to offer programs for Homeschoolers in 2017! These drop off programs are designed for ages 7 – 10 and will occur the second Wednesday of the month unless otherwise noted. The typical program includes interactive and outdoor activities (weather permitting), crafts, and games. These programs integrate scientific inquiry with STEAM (Science, Technology, Engineering, Art, and Math). Enjoy an evening in the park with your family, friends, and neighbors. The Licking Park District and partners will have activities and crafts pre-movie. The movie starts near sunset. Come with lawn chairs, blankets and snacks to enjoy! Licking Soil & Water is governed by a five-member Board of Supervisors elected by Licking County residents and landowners. The election is managed by the Ohio Soil & Water Conservation Commission, not by the county's Board of Elections. The majority of Licking County residents are unaware of our election process. We wanted to share this information about the LCSWCD Board election coming up in November and the search for potential board members. The Licking County Soil & Water Conservation District (LCSWCD) Board is actively seeking interested, conservation-minded leaders to continue the mission of promoting conservation of natural resources through local leadership, education, and technical assistance. The Supervisors, elected by county residents and landowners, help chart the course for soil and water conservation and natural resources management in Licking County. LCSWCD's Board of Supervisors is elected to three-year terms as a public official. Two Board members will be elected on Wednesday, November 8th during the Annual Banquet. Licking County Soil & Water Conservation District strives for a well-rounded Board of Supervisors. Current Board members can be found here: http://lickingswcd.com/about-us/board-and-associate-board/current-lcswcd-board-members. The deadline for submitting a Candidate Information Form for the 2017 Board of Supervisors election is September 8, 2017. If you have any questions regarding the becoming a candidate, the election process or the LCSWCD Annual Banquet on November 8th, please contact Denise Natoli Brooks at 740-670-5330 or denisebrooks@lickingswcd.com. The second annual “One World: A Celebration of Multicultural Licking County” will be held on Sunday September 24th from 3:00pm-7:00pm at the Bryn Du Mansion in Granville. The event encourages all people of Licking County to come together as one and to learn about their neighbors in this community and around world. Organizer Joy Williams describes this celebration is an opportunity for individuals of all cultures, races, genders, ethnicities, and socioeconomic classes, as well as disabilities, to learn about one another in a positive environment. This free family event will offer stage performances of multicultural music, dance, poetry and storytelling as well as numerous educational/cultural tables that will share culture, foods and information. Also featured will be an art gallery and food trucks with various ethnic cuisine. She adds, please bring your family and friends and celebrate with us at Bryn Du. supporter Bill Mitchell with the William Booth Award and local business Highlander Cleaners for 25-years of loyal support. The West Licking Historical Society will feature their Pataskala Cemetery Walking Tour on Sunday, October1st from 2:00pm till 4:00pm. You will be able to hear the stories of Tommy Allsup, a former slave who lived on the Abe Miller farm on Creek Road; Colonel John Alward, a member of a pioneer family and colonel in the State Militia; Dr. Loyd Bell, a physician in Pataskala in the early 1900‟s; Leverett Butler, „Deacon Butler‟ was known as the King of Hunters in the early 1800‟s; Carrie Cook Clark, a landlady and cook at the old hotel in Pataskala in the 1900‟s; W.C. Elliott, the first station master and telegrapher in Pataskala; George Lynn (aka Santa Claus), and not a happy Santa story; and Jessie B. McFadden, the first female postmistress at the Pataskala Post Office in the mid-1900‟s. Tickets are available at the Pataskala Banking Company, Bremen Banking Center, Park National Bank in the Pataskala Krogers, Pataskala True Value Hardware and the Nutcracker Family Restaurant. The Historical Society is asking for a $10-donaltion for adults, $5 for youngsters 6-18 years, and children under 6-years free. Starting (this) Friday, September 1st and continuing through Sunday, 3rd the Licking Valley Heritage Society presents the annual Flint Ridge Knap-In. Flint Ridge Park is at 7091 Brownsville Road in Southeastern Licking County. Visitors can learn from craftsmen and artisans about making arrowheads, spears and stone tools. It is a beautiful site to explore and learn of the area‟s history and geology! The cost is $5 per carload of visitors, and touring the Flint Ridge Museum is free. The Davis-Shai House in Heath will host their 3rd annual community „Oktoberfest‟ on Saturday, September 23rd and admission is FREE. This fun family event will run from 3:00pm till 10:00pm with food, beverage (beer garden) and entertainment. Davis-Shai is located in 301 Central Parkway in Heath. You won‟t miss the Buckeye game as they will have big screen TV‟s. This event is presented by the Heath Community Arts Council. 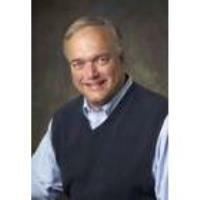 I can also be e-mailed at tbubb@lcounty.com, and my desk phone number at the Commissioner’s Office is 740-670-5118.